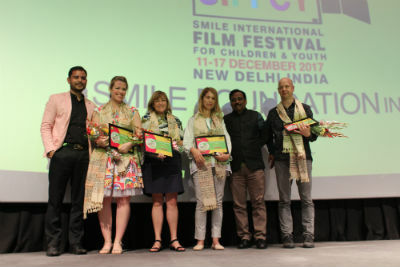 New Delhi: the award ceremony of the International Smile Film Festival for Children and Young People was held in the Sirifort Auditorium, New Delhi, in the esteemed presence of Santanu Mishra, Executive Trustee of the Smile Foundation and President – SIFFCY; Jitendra Mishra, Festival Director – SIFFCY and eminent international dignitaries. This year, in addition to the prestigious international juries, SIFFCY also had a young jury where the children have given their contributions in the selection of films. Under the adult jury (FEATURE MOVIES), Village Rockstars by Rima Das bagged the best children's film. Mom is wrong by Marc Fitoussi was awarded the best youth film Majid Esmaili Parsa won the best Director of the film Helmsman. Bad Lucky Goat received the award for the best story by Samir Oliverous. For the best actor, Banita Das won the prize of the movie Village Rock star. For the film with special message category, The Day my father became a bush of Nicole Kildonk. Under the title of adult jury: for the best children's film, The wind in the reeds by Nicolas Liguori, Arnaud Demuynck won the prize. The compartments of Daniella Koffler and Uli Seis won the best film for young people. For the best story My second eye of Ahmad Saleh took the prize and the naughty girl Ayce Kartal won the prize of the film with a special message. Winners in the category of jury: for the best film, Flying Rats by Emiel Sandtke was selected and My Second Eye by Ahmad Saleh won the Special Mention (For Direction )  Speaking on the occasion, Mr. Santanu Misra, Smile Foundation Executive Trustee and President – SIFFCY said, "SIFFCY was born out of this belief in the immense potential and power of cinema as a creative and attractive means to sensitize our Younger generation When we conceptualized it about six years ago, we only had one idea and a handful of people with us, but over the years, this idea gained strength as several people and related institutions joined the movement. one of them has made an invaluable contribution to the SIFFCY trip, and as the third edition of SIFFCY is present at the award ceremony, I am grateful to all who believed in our purpose and I lent their support. " The jury congratulated all the winners and the award ceremony ended with a vote of thanks from Jitendra Misra, Festival Director – SIFFCY. Jitendra Misra, Festival Director – SIFFCY said: "I would like to thank our international guests Mrs. Mar-Ien Cover, Ms. Shizuko Suya, Ms. Hideto Hayata, Ms. Seiji Mitsu- Nobo, Ms. Laurie Gordon and Mrs. Sigrid Klaus – Man for being here, interacting with our children and making it an unforgettable experience for them, and for Mrs. Rima Das for contributing her beautiful film "Village Rockstars" to the festival. Sincerely, we thank all our supporters and sponsors, school partners and festival partners for their participation, encouragement and support.As a festival, SIFFCY is still very young and has a long way to go and we hope that in the next few years we will take SIFFCY to the next level ". The international jury of SIFFCY 2017 consisted of Mr. Arend Agthe (Germany), a famous filmmaker known for Karakum and My Friend Raffi; Mr. Gert Hermans (Belgium), editor-in-chief of the European Children's Film Association; Ms. Judita Soukupova (Czech Republic), Festival Director, Junior Fest, Ms. Michal Matus (Israel), Director of the Department of Education, Cinemateca and Festival Director, Tel Aviv Int'l Children & # 39; s FF and Mrs. Chantal Bowen (Canada), a veteran filmmaker and executive director – Youth Media Alliance and the award-winning national filmmaker of India Anwar Jamal. The panelist of the film festival includes Mrs. Laurie Gordon (Canada), filmmaker; Festival Director – Montreal Animation FF and Ms. Marlaine Cover (USA), Spokesperson and Trainer, Life Skill Parenting 2.0.